Flavius Aetius, son of a magister militum of Scythian origin and a notable Roman, was born around 395AD. Raised in the court of Emperor Honorius, he was sent as a hostage to the Visigoth king Alaric from 405-408, then to the Hun king Rua from 409 to 412. At the court of the latter, he became friends with the king's nephews Attila and Bleda; it was also an opportunity for him to learn about the hunnic art of war. 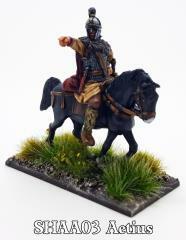 Back in Rome, he began a career in the Imperial administration. After having eliminated his rivals Flavius Felix and Bonifacius in 433, he became the most powerful person in the Western Roman Empire. He used his knowledge of the tactics of the Huns and massively uses the services of the latter during his military campaigns. For two decades, he protected the Empire, including Gaul, against barbarians, before subjecting them an imposing foedus: this is what happened to Clodion, King of the Franks, in 431, and to the Burgundians of Gundahar in 436. In 451, Attila led a massive raid into the lands of the Western Empire. Aetius brought together a coalition of Romans, Britons from Brittany and federated tribes from Gaul to face his old friend. He caught the Huns on the Catalonian Plains and forced Attila to retreat. In 454, Emperor Valentian III, fearing that Aetius would use his power and prestige to oust him, murdered his general. Six months later, the Emperor was in turn murdered by two of Aetius' barbarian officers during a military review.